June is National Crime Reading Month. What better time to introduce my Femme Fatale Series. What I like about the Femme Fatale character is her independence, her intelligence, her strength, her high sense of self-esteem and her belief that she can have whatever she sets her heart on. The Femme Fatal is an extremely gorgeous woman who knows how to use her sexuality as a weapon to get what she wants from the men in her life, sometimes leading them into very dangerous and murderous situations. The male protagonist (often a detective on her trail) who inevitably falls for her, is immediately in trouble. At best, he will suffer from a heartbreak, but more usually, she will convince him to commit crimes in exchange for the promise of having her. I hope you’ll drop by my blog so that together we can discover these lethal women staring in some of the best of Noir fiction. This entry was posted in Femme Fatale and tagged Femme Fatal, femme fatale, Lauren Bacall, National Crime Reading Month, noir fiction. Bookmark the permalink. Ohh! How fun! Can’t wait for this, Carol! 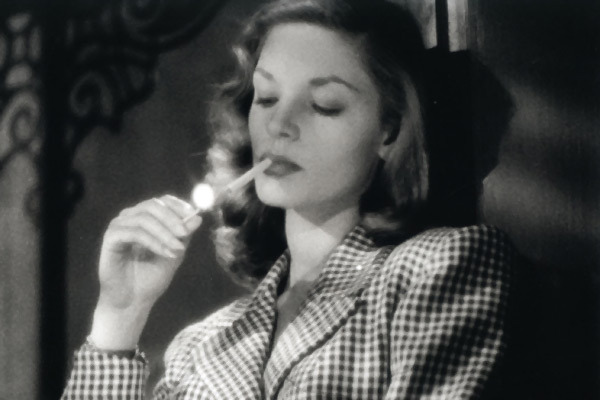 Lauren Bacall ROCKS! An interesting suggestion. I’d like to hear more on this platonic ideal in relation to the femme fatal. She is a very interesting and dangerous character. And she certainly seems to attract trouble. I’m curious to study why she’s such an enticing character. Seriously, did you ever see her in Farewell, My Lovely? There’s lots of examples of the Femme Fatale in film although I’ll be looking at this character in novels. Lots there as well. Is this a topic in which life imitates art, or is it the contrary, Carol? The Femme Fatale is such a powerful and alluring character type. Yes, powerful is a great word for the Femme Fatale. I’m not sure whether life imitates art or the opposite. My pleasure, Carol. It is an interesting topic for a post. Sounds like a fun series, doll! Love those femmes fatales! Where would we mystery writers be without them? 🙂 Great photo from Chloe’s Blog. Can hardly wait for the subsequent posts. Indeed the photo from Chloe’s blog is fantastic. It took me awhile to find the source and even now I’m not even certain that I have the first source. Though the series is limited to literary femmes fatales, I can’t resist mentioning one of my favorites from the movies: Jane Greer in Out of the Past. Poor Bob Mitchum didn’t have a chance! I’m happy that you have HL for la femme fatale – she is an intriguing character. An in your face – larger than life character-the kind of strong character worthy of being in a novel. one question, SVP: why my comment is still awaiting moderation?… It’s not the first time I drop a line at your blog, so could you “enlighten” me, please? Sounds like it should be an entertaining and insightful series—I’m looking forward to it! I know Joan Crawford may have also been one. Hello Thank you for Following me .Your story sounds spicey .Have a nice morning. I’ve only recently been around your blog and find it informative and fun. Black and white photos are beautiful .. I love this:) It’s wonderful and more women should wear that fabulous label with the warning. Thanks for reading and commenting. 🙂 I’m glad you liked the post. Thank you Carol. Another wonderful series to remind us of. You made me want to watch them and I this what I am going to do. The Femme fatale has a great history in the past it’s an irresistibly attractive woman, especially one who leads men into difficult, dangerous, or disastrous situations; siren. Origin of femme fatale. French: literally, fatal woman. This is a wonderful post!!! Thank you so much. I am happy that you enjoyed it. Happy Holidays to you and your family.